Visit Our Recycling Center Today! Do you have a bunch of scrap metal and other recyclable items lying around that you need to get rid of? At NHKelman, we provide a reliable scrap yard where you can bring all your recylcing items. Our recycling center takes all kinds of scrap metal. Stop in today, we proudly serve Clifton Park, NY; Saratoga, NY; and Albany, NY. In this day and age, the importance of saving and maintaining the environment has become a growing ordeal and we’re here to help and lend a hand. From scrap metal to paper products, you can feel reassured knowing that you’re offering a helping hand too. Let us help you help continue the growing eco-friendly trend with the services offered at the area’s leading recycling center! Welcome to NHKelman, Inc., your premier scrap yard and paper recycling center in the Capitol Region. We always guarantee that you will get the very best value for all of your recyclables, including both ferrous and non-ferrous scrap metals. We pride ourselves in being an avid leader towards maintaining eco-friendly practices for our environment. We are located at 41 Euclid Street in Cohoes. If you are from the Saratoga, NY, Albany, NY or Clifton Park, NY areas, stop on by with your scrap metals and other recyclables! If you have recycling or scrap metal to get rid of, we're happy to help. We are a large and eco friendly recycling center serving the entire Capital Region. From our personable staff to our guarantee of fair prices, you'll see why so many customers choose to utilize our scrap yard for all of their unused metals. We Take All Types of Scrap Metal! 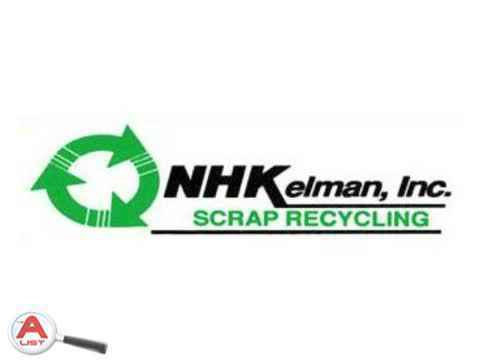 NHKelman is a family owned and run recycling center and scrap yard, and is the only one in the Capitol Region where you can earn top dollar for your many recyclables. We have been proudly serving the needs of folks all over the area for over a century. Back then, we were a quaint little horse and buggy business, and now we are a leader in the recycling business. We are happy to serve those from as far north as Canada all the way to North Carolina. We are more than just an ordinary recycling company! From scrap metal recycling to our top-notch roll-off containers and more, we have you covered with a wide range of services. We boast the best customer service and ensure that the specific needs of our clients are met. We serve customers in Saratoga, NY and the surrounding areas. If you have scrap metal you need to dispose of, we can come to your location and pick it up. Call us today. At NHKelman, we know recycling. We are the leading recycling center to serve areas such as Albany, Saratoga and Clifton Park, NY. Our business is scrap metal and recycling and we are committed to our hard work. NH Kelman is a fully operational recycling center. We have everything in place to keep our operation running smoothly and to keep our clients satisfied. If you're interested in recycling scrap metal, contact us today or stop by! At NH Kelman, we are able to accept all types of scrap metal including ferrous and non-ferrous pieces. Many times, industrial clients come to us with scrap metal pieces from jobs they've just completed. It is easy to drop off your scraps right here in our scrap yard. We welcome all types of metals. If you are ever unsure about the best way to recycle, let us assist you. We are proud to be an eco-friendly recycling center for Clifton Park & Albany. NH Kelman wants to make your choice simple. If you have extra scrap metal pieces, you can easily get rid of them at our convenient recycling center. We are located close to Albany, NY and Saratoga, NY which makes taking a trip to the scrap yard very convenient. If you would like to learn more about NHKelman, feel free to visit our website by visiting http://www.nhkelman.com/. You will find more in-depth information regarding the services listed below as well as some fun history facts about our recycling center and scrap yard. We make it easy for commercial and industrial clients to recycle their scrap metal in Saratoga, NY. Bring your scrap metal to our recycling center and leave with cash. For larger quantities, we offer roll-off and pickup services, making recycling even easier. Whether you drop it off or need us to pick it up, we are here to help you get the most out of your scrap metal. For more information, call our recycling center today. Here at NHKelman we handle all ferrous and non-ferrous scrap metal in our 20,000 square-foot warehouse that where we can serve our customers more quickly and efficiently. If you are interested in recycling scrap metal of any kind, we will gladly help. From individuals to large industries, it is in our best interest to provide you as best as we can. Regardless you have a small box filled with some scrap metal or if you own a construction company with truckloads of large scrap metal, we can take it off your hands. Taking your scrap parts out to a scrap yard is great for more than one reason. Not only can you get a great deal for the metal parts you no longer need, it is also recycled in a proper way. Our recycling center has been an important part of the Albany and Saratoga, NY communities for years. Customers know where to bring their unused scrap metal for a fair, accurate market price. At our scrap yard, our professionals maintain a firm adherence to the present value of commodities. In doing so, we utilize top-of-the-line N.Y.S. certified scales, where we accurately and carefully weigh and price all commodities in front of the customer. You may find other scrap yards close to Saratoga, NY, Clifton Park, NY or Albany, NY, but why travel elsewhere when NHKelman is as convenient and excellent as it gets. As a reliable, reputable and most called upon scrap yard, we can show you the most current dollar value for your scrap metals. Stop on in; we’ll accept any amount of scrap metal that you need recycled and we will provide you a same-day payment as well. Our state-of-the-art processing equipment allows us to ship your recycled scrap metal to some of the highest paying markets around the world. A Scrap Yard for Commercial and Industrial Clients! Don't discard your unwanted scrap metal. Many metal items can be brought to our recycling facility and deposited onsite. Our center is conveniently located for residents of Clifton Park, Saratoga, and Albany, NY. Think of NHKelman for all your scrap metal and paper recycling needs. Our recycling center and scrap yard is a reputable name when it comes to historical thriving businesses. We’re a business that helps the environment and that pays you top dollar for your recyclables and scrap metals. Stop by today at NHKelman!